GUY Engineering hosted two ribbon cuttings in Sequoyah County on June 22, for BR # 87 over Camp Creek and BR #88 over Rabbit Branch. 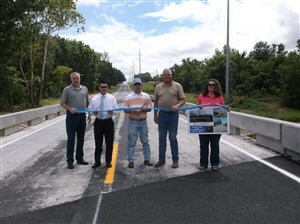 The two bridges were replaced as part of a $2.9 million project that also overlaid 3.9 miles of Old US-64 and added safety features that included gravel shoulder, guardrail, and new striping. The original Bridge # 87 over Camp Creek was a functionally obsolete I-beam bridge built in 1935, while the original Bridge #88 was a structurally deficient I-beam bridge built in 1934. The new PC beam bridges were designed by Guy Engineering Services of Tulsa, OK and constructed by Treas Construction, Inc.
Funding for this project was provided by County Improvements for Roads and Bridges (state funding).